« Return of Sunday! Sunday! Sunday! Meena and Khal are at left, Jim Sayers of ACA is the rangy dude in red, Stephen Newhall is wearing the nifty celeste-and-white Rob and Charlies kit, and some ugly old man hiding behind Stephen is pretending he’s me. The Adventure Cycling Association Bicycle Route 66 Tent Show and Revival came to Duke City this weekend to preach the gospel of bicycle travel, and Khal, Meena and I were among those saved. Being a relative newcomer to Albuquerque, I helped get us good and lost a couple of times on the 30-mile ride; I’ve done portions of the north and south stretches, but generally choose other east-west connectors. Happily, we got dialed in once Stephen Newhall from Rob and Charlies in Santa Fe caught up with us downtown to show us The Way. Khal and Meena were on their Co-Motion tandem, while I rode Soma the Lesser (my Double Cross, outfitted with Arkel Dry-Lites to catch all the layers I peeled off as the day warmed up). It was the first chance the three of us had to ride together after years of online correspondence, so now the rest of y’all will have to catch up. You’re already one ride behind. This entry was posted on April 20, 2015 at 6:02 pm and is filed under Adventure Cyclist, Albuquerque. You can follow any responses to this entry through the RSS 2.0 feed. You can leave a response, or trackback from your own site. That was a great day of riding in Albuquerque, Patrick. Thank you very much for your hospitality and camaraderie. Sure beat working. I should’ve taken more pix (this one was courtesy of a churchgoer), but I always get sidetracked, generally by my endless capacity for shooting the breeze. Same thing happens at races and trade shows. Instead of journalism it’s jaw-nalism. So it goes. So, how do the rest of us catch up? Is there a Mad Dog Media ride coming up soon in Duke City? Or maybe in Arizona? Hm, good question, Pat. Sounds like our allergy seasons are about equal, so six of one, half a dozen of the other. There’s the Tour of the Rio Grande Valley coming up in September, but I’m not certain of the dates. Betcha anything it conflicts with Interbike. We’ll have to puzzle it out. Tour of the Rio Grande Valley sounds interesting. Allergies have had their way with me the last few days. Not sure why this year is so bad so far. I was stuck in the house all day Friday, and yesterday wasn’t much better. Did sneak in a short ride this morning. 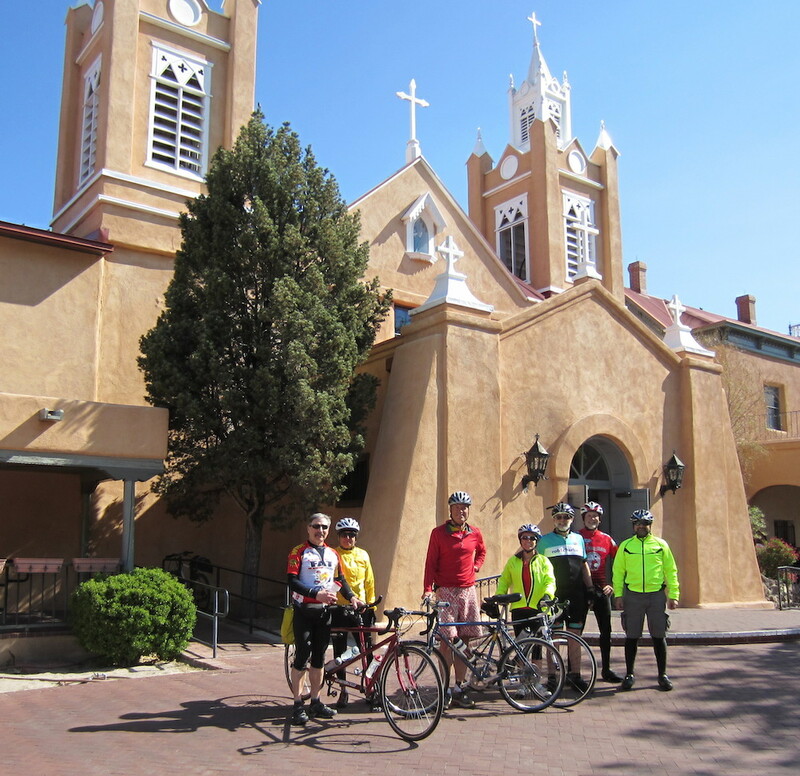 The Santa Fe Century is coming up in May, on the 17th. This year they are doing a Gran Fondo for those who want to spend more money in return for beating themselves senseless. Sorry, I gave that up long ago when I traded in my knee tendons and USCF license for double patellar tendinitis. There is a sorta hard 100 mile course and also a really nice 50 mile route that cuts from just north of Madrid over to Galisteo and back up to the City Indifferent. That’s what we generally do on the tandem, since we are old farts and 100 hard miles is especially hard on my bride, even with a boingo stoker seatpost. Could always be finished off with lunch at The Shed (which aside from great food, makes great margaritas). Map is here. Any takers? Too bad I was on the road back to home or I would have joined the bunch. Have to try for another time. I know Mr Newhall pretty well and look forward to making everyone else’s acquaintance. I spent last week in the Palm Desert/Palm Springs area, chasing the wheels of wily retirees who’ve spent the entire winter riding 200 miles a week while I was on a trainer or bundled against the cold. Luckily I had age on my side, and can out climb most. It was nice to ride in shorts and short sleeves and get a start on my cyclist’s tan. I am considering the Santa Fe Century, it’s perfectly timed for my early season goals (not complicated, basically “ride lots”). But my compadre who promised to do it with me is threatening to bail and default to the 50 mile route as he’s unsure he can get up Heartbreak Hill. Good morning! The Santa Fe ride sounds great Khal, but Sandy will be back East visiting family during that time. I will be doing the “home alone” bit, and if I went to Santa Fe without her (she wants to visit there badly) I would be sleeping with Duffy for a long while. Once we move into the Solana Estate, you have to drop by. We can’t seem to get anyone to visit us in BombTown. Must be the Plutonium glow in the trees…. I’ve been trying to convince you all to meet me in Dysfunction Junction for a Tour of the Moon ride. Or I can meet you wherever you like. If something like that was going on before or after Interbike it might be enough excuse for me to throw a bike in the car and drive out there rather than fly – since from Iowa it’s on they way. Haven’t seen the Tour of the Moon route since the old Coor’s Classic daze. If anyone is heading way back east to Richmond for the World Championships in September, we have plenty of good riding available. If you insist on trying the two cobblestone climbs, I’ll be waiting at Poe’s Pub at the bottom of the longer one. Fell over the last time I came _down_ the thing, one night last winter. We’re going, but since it’s “way back east to Richmond” it’ll be via airplane and without bikes for the weekend. Shoot, I missed your note here. I would have loved to have popped by, too. But I was up in Bibleburg earlier in the week, and had a previous commitment to Herself to spend Saturday organizing the garage, which looked an awful lot like a bike swap hit by a drone strike. Holler at me again next time something’s going on and I’ll try to pull my thumb out. I’d like to meet some more local folks, and the Sport Systems people seemed very pleasant during my one visit so far.